Daylilies offer great color and presence in you garden with little maintenance. These perennials are hardy in USDA zones 1-11. They are so common along ditches in rural areas that they are considered by some to be native wildflowers. Their origin, however, is from Eurasia and they were brought here by early settlers. These easy to grow plants are usually propagated by division. This process assures that the new plants grown from the divisions will be true to the original. These beautiful plants do produce seeds when pollinated and it is generally possible to grow new plants from these seeds. The seeds can be found at the base of flowers that have been pollinated. It should be noted that all daylilies grown from seed are unique, even if pollinated from the same plant. 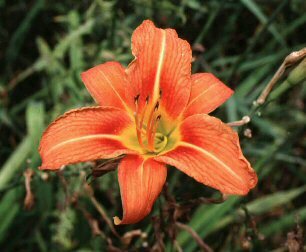 This and the fact that the flower is large and easy to work with has led to the daylily being one of the most hybridized plants in the world. Transplanting or dividing plants is best performed in the early spring or after the plants have flowered. Fall division is preferred, however, and spring divisions may not bloom the same year. Division is performed by digging up the entire plant and gently separating the leaves. Divisions should have 2-3 stems or "fans" of leaves and as many of the roots as you can get. Cut the leaves back to about six inches and plant the divisions so that the crown where the stem and root merge is about one inch below the ground line. As always when transplanting or dividing plants, water thoroughly and mulch to help the plant re-establish itself. They can be divided every three to four years. You can plant divisions any time that the soil can be worked. Dig a hole large enough so the roots aren’t crowded. If you have performed a soil test, you should also add any necessary fertilizer. Adding organic matter in the form of compost or composted manure never hurts any plant, either. Daylilies are very hardy and need little care that is out of the ordinary. Remove any dead foliage in the spring and give them a dressing of compost. Mulch them to keep the weeds down and that's pretty much it. Removal of seed pods after blooming will help ensure a good display of flowers next year.